A major pyramidal crystal display was observed on 5 June in Southern Finland. The center of the action was located in Tampere, where the photo above was taken by Jari Luomanen. Several people noticed the display and photographic documentation is extensive. For more photos, browse the messages of our mailing list ( 1 ), starting from 05.06.2008. This is an incredible display, and the images are breathtaking. Mother Nature did it again. Monster brutal giant great amazing beautiful halo display! Best of odd radius. I am really shocked by this image ... but is it the only picture of the display? At the bottom of the fourth arc it looks that something is going on, am I wrong? Congratulations anyway! Click on the image, Francesco, and you'll see the other images by Jari. Thanks everyone. It was a spectacular display and a lot of fun to observe. As this post is extremely brief I will be adding more images and text to my website but already it contains many more images. I have still to go through half of the photographs, so hopefully some new exciting details will emerge. I will also add simulations and some weather data. The display was truly stunning. I was on the phone with Jari and Marko several times during the day discussing the evolution of the display. In Riihimäki the peak wasn't as hard as in Tampere, but still worth a look: Photos of the display. I was already having my best ever odd radii in Lahti, but talking with Luomanen in the phone it became clear that he had something way better. Conserning the pyramid circular halos, it is difficult to imagine how this display could be topped. Nice odd-radii display in Turku as well, but still nothing compared to the clarity of the Tampere display. Thanks Veikko. We were busy at the time of this posting, that's why the minimum effort solution. Same dispaly in Estonia as well. This time I had enough time to set up the halo gear and start shooting. Looks like the crystal cloud was somewhat better oversea than here. It all started with 9 and 24 halos and began to develop. A full parhelic circle with 120 parhelions fallowed. 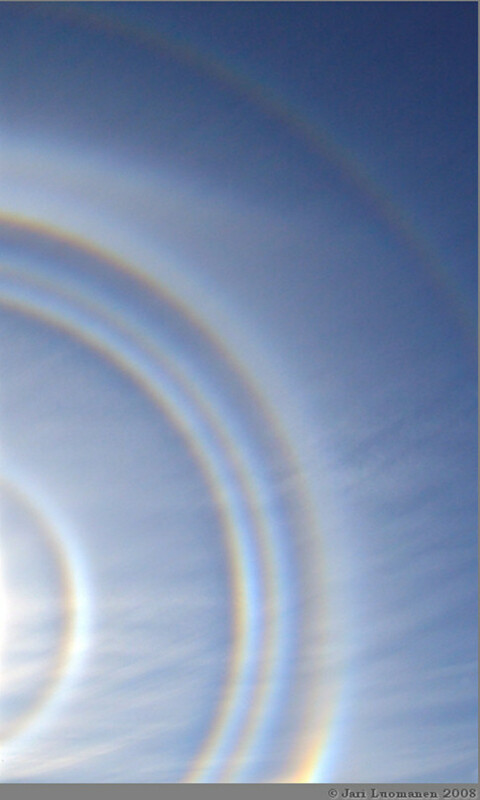 Although the 18 and 20 halo are almost nondistinctive, they can be seen on separate images. Visser claimed at the time (1940s) the existence of supernumerary halos, radii 18 and 19.5 deg. These were observed in 1905 and 1916, by Hissink and Barlow, respectively. In my view, there is no doubt that those halos consist of the same halos as the one seen here -- only the interpretation was wrong. Visser even calculated from the distances of these 'supernumerary halos' the size of the crystals; by accident the result was not too far off from what we nowadays know. Looking to this picture, I can quite understand that Visser (and others) were deceived in that direction. As this post is extremely brief (plus the editing of the title image for this post above is not that great) I thought of posting this gallery for those who google this post up later. Gunther, thank you for providing this interesting point!